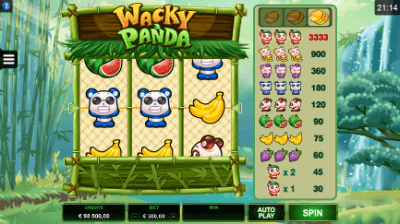 The company-developer Microgaming pleased fans of classic slots with the novelty named Wacky Panda, the main characters of which were amusing emotional pandas. This fervent animal invites you to plunge into the exciting world of casino slots and try your luck! In China, panda is often considered a symbol of success, you can try to prove whether it's true or just a myth. So, what new items has this slot prepared for you? Let's try to get to know it better. The novelty is a three-reel gaming machine with one payline. This feature distinguishes it from all other slots, produced by modern developers. The bet on the spin is from $0.01 up to $15. The active bar is located in the center of the screen. The player is offered with eight elements, seven of which constitute a winning chain of three identical icons, and one can form combinations of one character on the active band. The payout ratio is from x10 to x1.000. The winning combination is one; the round for doubling is absent. A user-friendly interface will be comfortable enough even for a beginner, you will easily understand how to deal with its management. As already mentioned, the main symbols in the game are fanciful pandas. In addition, on the screen you can see fruits: watermelons, grapes, and bananas. A special symbol in the gameplay also exists but there is only one such an image. It is represented by a panda in a cap made of watermelon peel. This symbol brings the player a payout, appearing in any position on the active lane. Jokers and scatters are absent; in this respect, the slot is quite simple. The paytable is located to the left from the reels. You can choose the size of the bet in the table. Using the setup buttons, you can mute the sound and activate the fastbacks. Gameplay does not have to be downloaded; the game runs in the browser, including the ones from the smartphone. The game Wacky Panda will appeal to fans of classic slot machines. The slot has a rather high degree of variability. Simplicity of design was not reflected negatively on the amount of payments. A winning combination will bring a significant payout to the player.